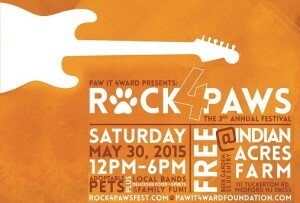 The 3rd Annual Rock 4 Paws, an all day outdoor concert, will happen from Noon until 6 p.m. at Indian Acres Tree Farm. This family friendly, all day event helps to raise funds for rescue animals in the South Jersey area that have medical needs. Admission to the event is free and includes live music from great local bands like The Defused, Danielle and Jennifer, The Jericho Horns, Magnificent Birds of Prey, Soul Meets Body, The Williamsboy, and Buried in NJ. The event includes local rescues and shelters, so come up and meet their adorable, adoptable animals. For the kids, there are alpacas to meet, face painting, a moon bounce, and other fun activities. Many people bring their dogs to enjoy the day and some pups will even be in costume. Some of these activities, like the moon bounce, request a small donation to benefit the medical fund. Rescues and shelters represented include ACCT Philly, One Love Animal Rescue, 4 Paws with a Cause Rescue, West Jersey Volunteers for Animals, All they Need is Love, A Pathway to Hope, Lynn’s Animal Rescue, and 4 Paws Dog Rescue. The event is sponsored by TD Bank, Pet PT Veterinary Rehabilitation & Physical Medicine, House Paws Mobile Veterinary Service, and Ruff House Doggie Daycamp. Sponsorships are still available so please feel free to contact us if you are interested.